Every October York Rite Masons from Arizona, California, Nevada, and New Mexico gather to confer the Degrees and Orders upon worthy Candidates, as a courtesy to their home Bodies. In our over quarter century history we have had the honor of conferring the Degrees and Orders of York Rite Masonry on well over 1000 candidates from twelve jurisdictions, from both North and South America. Attending the conferral of the Degrees is the "Masonic Motivation", but the Colorado River Fall Festival is really about camaraderie, fraternalism, education and cooperation. You'll see some of the finest ritual work in the Southwest - we have been used by smaller Bodies as a model for their work. In addition to the conferrals on Monday and Tuesday, there will be Candidate Orientation Sunday evening, a Fellowship Banquet (with entertainment following) on Monday evening, and a "friendship tea" for the ladies, with pastries, beverages, friendship and hospitality mid-day on Tuesday - ladies, bring your Teddy Bears! 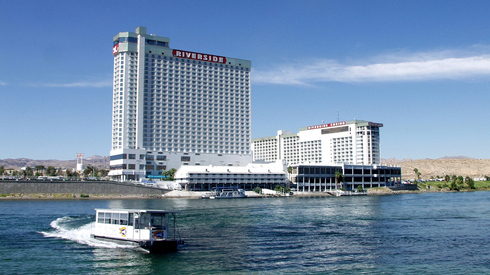 Don Laughlin's Riverside Casino provides our annual venue and a wonderful opportunity to stay for a few more days and turn this event into a vacation! (Click Here) and Register now! Be sure to bring your lady - she will have the opportunity to make new friends, visit fun and interesting locales, do some shopping, take in a movie or two, eat a fine meal at a very reasonable price, and you both can enjoy some "Nevada Style Entertainment"! Be sure to register her for the Ladies Tea on Tuesday at 12:30 PM.